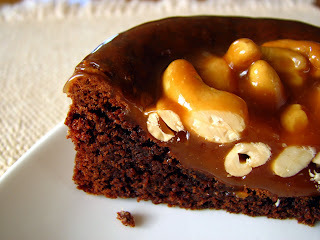 Being the sucker that I am for anything caramel, I couldn't pass up the chance to make a brownie cake topped with homemade caramel and nuts. The nuts in question were supposed to be peanuts but, my apologies to all of you peanut lovers out there, I was not going to make this cake with salted peanuts. I thought about pecans, which would have been lovely, I'm sure, but I got a flash when I saw a tin of cashews at the grocery store. "Aha! Yes, cashews, that's it!" I love it when that happens. Anyways, I decided to halve the recipe because, again, knowing how much I love caramel, making the whole cake would have been dangerous. I even bought a few mini-springform pans for the occasion. Ah, how nice it is to have an excuse to shop for kitchen stuff! 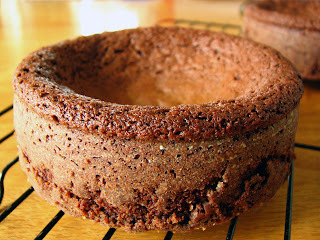 Once my cutie cakes were baked and out of the oven, I noticed a little something was amiss. They both had huge craters in the middle! Hmmm, Dorie warns about the cake forming a small crater upon cooling but this was not a small crater! OK, moving on to the caramel, I must give you one word of advice: don't let yourself be distracted while the sugar is caramelizing! It will turn from a beautiful amber color to an awful burnt brown in a matter of seconds. If that happens, don't even bother with the cream and butter, just start over with a new batch of sugar. My second batch of sugar, water and corn syrup was watched much more closely and became the gorgeous caramel called for in the recipe. The crater-cakes were then filled with spoonfuls of cashews and caramel and left alone to rest. The caramel wasn't runny at all once it had a chance to set, but it wasn't hard either, just the perfect texture. All my taste testers were in awe of the cake and so was I. 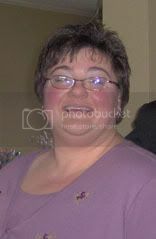 Another great Tuesdays with Dorie! Tammy of Wee Treats by Tammy chose this knock out cake this week so you must visit her for the recipe! Your caramel looks divine and I love cashews. Come over to my website and see the disaster my kitchen produced this week. I'm not meant to cook caramel I think. Adorable! And I love cashews as well. Mmmmm. What a great combination- cashews would have been so delicious on this cake! I love your minis! Mine developed a huge crater too, but that just left more room for the caramel! 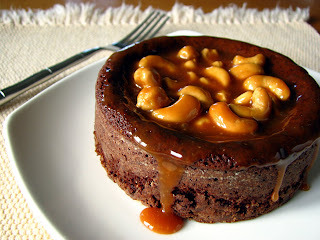 That crater actually served as a nice bed for your caramel and cashew topping! Gorgeous! the crater looks like the perfect resting place for the caramel and cashews! great job! Meow, those cashews look amazingly delicious. Very nice pick. I agree with the others---that crater is a gift from the baking gods to hold more gooey, delicious caramel! I love cashews! I totally should have done cashews. I debated between peanuts, cashews and pecans but I finally decided to go the traditional route. It was good but I bet the cashews were great! Dang. I bet cashews were intense and wonderful on this cake. Great work. Oh wow, this really looks great! Love the cashew idea!! J'aurais du penser moi aussi, à faire des petits gâteaux, parce qu'avec un gros... j'en ai eu pour des jours, et c'était bien, bien sucré... peut-être même un peu trop à mon goût! Great choice! So gooey and delicious!!! Yours look so fabulous!! I am so excited, I finished mine and it was my first recipe with TWD as I am a newbie :) I had to omit the nuts, but it was wonderful just the same. I'm a fan of the crater - more room for caramel :) And I love the idea of cashews, great job! Yours looks so good. I made it but the cake was dry. Don't know what happened. Beautiful little cakes, craters and all! I can't even tell you how amazing that looks. I want some of it right now! Perfect call on the cashews, by the way! Yum! your caramel looks absolutely divine. Cashews are never a bad choice either. looks sooo fantastic - beautiful job! That looks so good it hurts my teeth! ha! Yum, I bet the cashews tasted great! I'm with you on the peanuts, not my thing at all. I love the crater! :) Much more room for the caramel and cashews! Looks wonderful! wow, your cakes looks so delicious!! thanks for making my pick! Your cake is so cute! That is a huge crater, though! 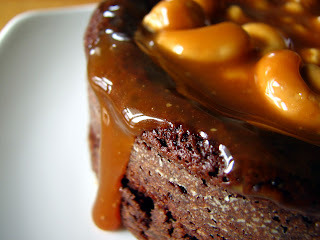 This looks amazing, I love chocolate and caramel together. It really is a nice change to see my favorite nut being used in a dessert. The crater holds the caramel perfectly! And I bet cashews were delicious in this...mmmmm. Cashews would make this cake like one of my favorite See's candy pieces. Lovely! Just rename them Caramel Crater Cakes and then the crater is what makes the cake! Looks so delicious. Definitely better with cashews! Your little cakes look great and that caramel is perfect! Well done! I'm so glad I'm not the only one who did the caramel more than once. It still wasn't perfect, but I'll get there. Love the addition of the cashews! Sinful! I really wanted to do cashews. It looks awesome! Incredible job as always! Wow, your cake looks so good!! My caramel was still quite runny, bit very tasty! Fantastic idea with the cashews, and with really beautiful and delicious looking results! I love cashews! Your cakes look delicious! Sale in my Etsy Store! Cashews -- now there is a seriously great idea! 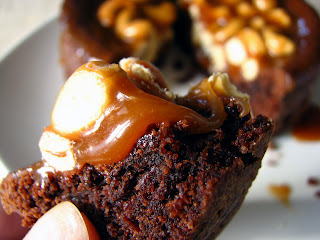 I am starting to think that Dorie intends for those craters to be there to hold all of the nuts & caramel? Well, that's my story and I'm sticking to it. Your cake looks perfect! 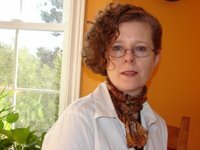 My mom would love your version! She is a cashew lover! Great job! Great choice to go with the cashews! Had to be tasty!! Looks amazing, Lyb! I agree, it's always fun to by a new kitchen toy and your little pans were a good investment. Those pictures are worth a thousand words! That looks divine!!! Oh yum. I think I'm gaining weight just looking at these photos. I understand about the craters! Your caramel looks delicious!! This looks great! I love the addition of cashews. The mini version is so cute. ohh those are lovely! the cashews sound teriffic!! Great idea to use cashews!! Looks delicious! Cashews sound like a great combination with chocolate and caramel. These look gorgeous! I remember attempting the big version, but I much like the smaller ones. Really nice!